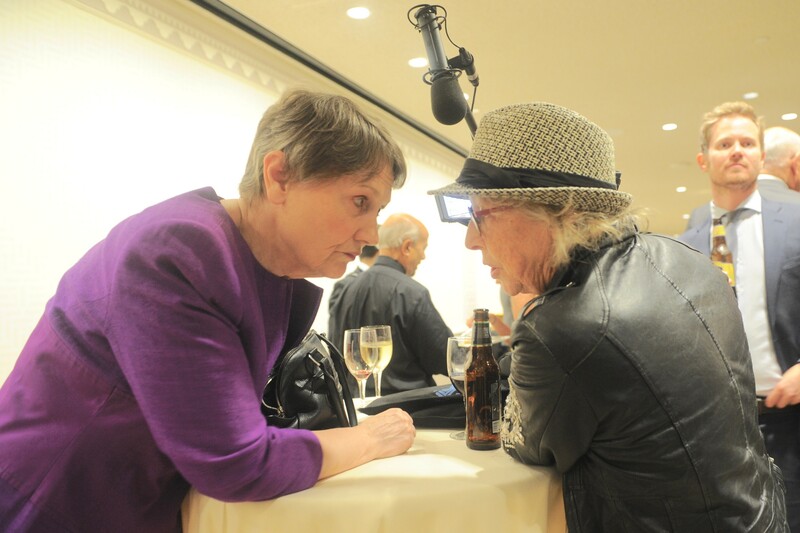 Christchurch – It’s great to see doco-maker Gaylene Preston make a film about Helen Clark. The film, My Year with Helen, will premiere at Auckland’s Civic Theatre on July 23 as part of the opening weekend of the NZ International Film Festival. There will be a second screening at the Civic on July 25, followed by Wellington, Christchurch, Dunedin and Nelson screenings. The fly on the wall documentary follows former Prime Minister Helen Clark campaigning to become the first woman UN Secretary-General while continuing her work as the highest-ranking female at the UN. Preston’s cameras explore the cracks between the diplomats, the embedded press and feminist activists as they push for change while caught up in a power process as secretive and patriarchal as the selection of the Pope. Clark says the film conveys how tough it is to break the remaining glass ceilings. “May it motivate future generations of women to keep at it,” she says. I had a bit to do with Helen when she was prime minister. I was based in London from 1997 to 2001 as NZ Press Association’s London bureau chief. Helen made several trips to London and she got me inside 10 Downing Street and I met Tony Blair before she had a private chat with him. On another trip, I spent several days with Helen at the world leaders’ summit in Berlin. Many world leaders attended including Bill Clinton and Thabo Mbeki, who served as the second post-apartheid President of South Africa from 1999 to 2008. I chatted with Helen about her meetings with the leaders and she said it was just wall to wall bi-lateral discussions. I knew she liked to keep fit so I suggested I would pick her up at 6am the next morning and take her on a bike ride through the Brandenburg Gate on the Luisenplatz, through the city’s gardens. It was a lovely warm summer’s morning. I had to tell Helen to ‘keep up’ at one point as we were biking too slowly. We cycled passed past a remaining section of the Berlin wall down streets where so many buildings still carried bullet scars from the last days of fighting in April 1946 just before World War 2 ended. We then finally got back to the Adlon Kempinski Berlin Hotel in time for breakfast. The next day I tagged along while we had a private tour of the newly opened Holocaust museum – it felt very scary inside. Helen is an extraordinary woman and great ambassador for New Zealand. She is very measured, very determined and very strong. I can’t wait to see this film – and hopefully learn more about her.